A wildlands- and buffalo-loving activist writes passionately about restoring the Great Plains in a Buffalo Commons. Ten years later, Frank and Deborah Popper review their controversial proposal for a Buffalo Commons, and find that many of their predictions are coming true. "Atlas of the New West" explores a rapidly changing place with maps and thoughtful essays, and it can also direct you to a rodeo, or to the nearest copy of The New York Times. "Heart of Home: People, Wildlife, Place" by Ted Kerasote is reviewed by Stephen Lyons. "Storm Over Mono: The Mono Lake Battle and the California Water Future" by John Hart is reviewed by Jane Braxton Little. Steve Chapple's "Confessions of an Eco-Redneck" is reviewed by David Helvarg. Friends of the River's 18th Annual Rivers Festival, Feb. 20-22, at the Fort Mason Center in San Francisco, Calif., will focus on "Protecting Rivers for the Next Generation." Rabies, Lyme Disease, Hanta Virus, oh my! "Rabies, Lyme Disease, Hanta Virus and Other Animal-Borne Human Diseases in the United States and Canada" by E. Lendell Cockrum is reviewed. Trout Unlimited is trying to restore native wild trout to Colorado's rivers and lakes. "The Next West: Public Lands, Community and Economy in the American West," edited by John Baden and Donald Snow, is reviewed. Environmentalists are fighting the Forest Service's proposal to open 370,000 acres south of Yellowstone to oil and gas leasing. The Park Service plans to restrict cars in Grand Canyon, Zion and Yosemite national parks, replacing them with light rail and buses. 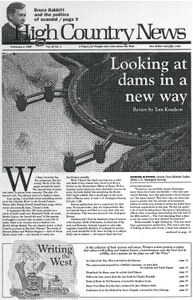 The 1998 Arkansas River Basin Water Forum meets in La Junta, Colo., Feb. 4-5. The North American Interdisciplinary Conference on Environment and Community is set for Feb. 19-21 at the University of Nevada in Reno. The International Association of Wildland Fire holds its second conference March 29-April 1 in Coeur d'Alene, Idaho. A Defenders of Wildlife conference, Restoring the Wolf, is set for Nov. 12-14 in Seattle, Washington. Spam and other worst recipes; bears raiding Denver fridges; South Dakota's religious tolerance; deer jumps into Montana van; what helicopters spy in the Central Arizona Project's canals; cow pie lagoons; Hong Kong film subtitles. Kevin Markey visits; more visitors; congratulations, Skip Edwards and Margaret Murie; winter intern J.T. Thomas. Zoologist Ronald Nowak resigns from the U.S. Fish and Wildlife Service in protest over the agency's failure to do its job listing and protecting threatened species such as the Canada lynx. The Supreme Court rules that the Isleta Pueblo tribe in New Mexico has the right to order the city of Albuquerque to end its dumping in the Rio Grande River. Parks may restrict jet skis; Yellowstone will keep Hayden Valley trail open to snowmobiles; Delyla Wilson sentenced for bison-guts protest; USFS to do land swap with Weyerhaeuser in Wash.'s Cascades; John Mumma to retire from Colo. Division of Wildlife. Southwestern ranchers Jim Winder and Will Holder team up with Defenders of Wildlife to create a seal-of-approval for beef sold by ranchers who avoid killing predators. Cattle ranchers in Montana and other Western states are earning extra money by charging hunters to hunt on private property to which they once allowed free access. Interior Secretary Bruce Babbitt's tangle with Republicans in Congress who want to have him investigated by a special prosecutor for denying an Indian casino in Wis., is simply another example of the new "culture of scandal" in action. The Clinton administration's proposed moratorium on road building in roadless areas is meeting criticism from the timber industry, as well as from environmentalists who say the proposal excludes too much land.